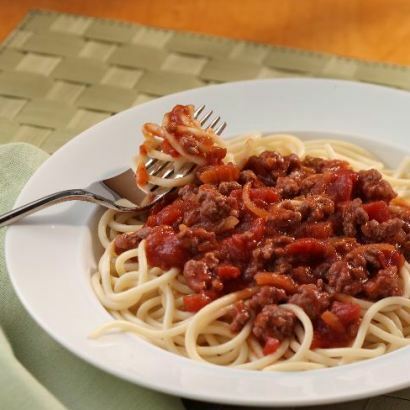 Stewed tomatoes, tomato sauce and onion soup mix combine with ground beef for a super sassy sauce! Mix tomato sauce, tomatoes with their liquid, the soup mix and sugar in large saucepan until well blended. Stir in ground beef. Bring to a boil over medium-high heat. Reduce heat to medium-low; simmer 20 minutes, or until heated through, stirring occasionally.